SPRINGDALE, Ark. (NBC) – There’s a new chicken nugget recall to alert consumers about. 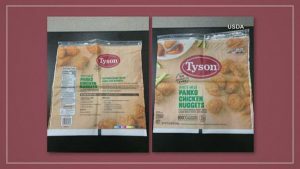 Tyson Foods is recalling more than 36,000 pounds of chicken nugget products due to possible foreign matter contamination—specifically rubber. The recall involves 5-pound packages of Tyson White Meat Panko Chicken Nuggets produced on November 26th, 2018. The product has a “best if used by date” of November 26th, 2019 and case code number 3308SDL03. These items were shipped to retailers nationwide. So far, there have been no reports of illness or adverse reactions associated with the chicken nuggets. Consumers are urged to discard the product or return it to the place of purchase. Earlier this month, Perdue Foods recalled a batch of chicken nuggets due to customer complaints about finding wood in the products. And just yesterday, Perdue recalled chicken nuggets due to a known allergen—milk—not declared on product labels.